This is the opening chapter of the history of Glen Girnoc(k). Nobody (it is almost safe to say) has heard of this glen. However it is where my Gordon family came from. The glen nestles in Royal Deeside: between Balmoral (Scottish home of our Queen) and Birkhall (Scottish home of the Prince of Wales). 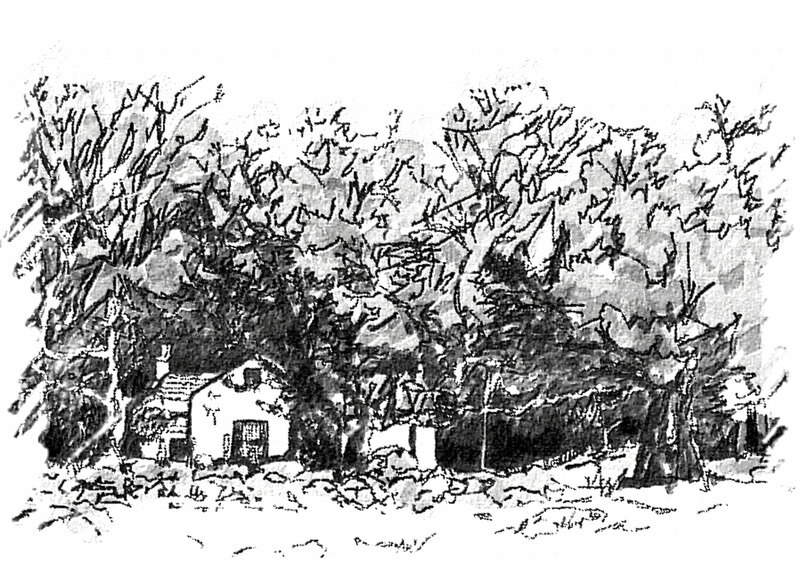 All drawings and sketches by Peter J. Gordon, except the watercolour below which is by Howard Butterworth. The first exercise must be to annotate you to the small glen. 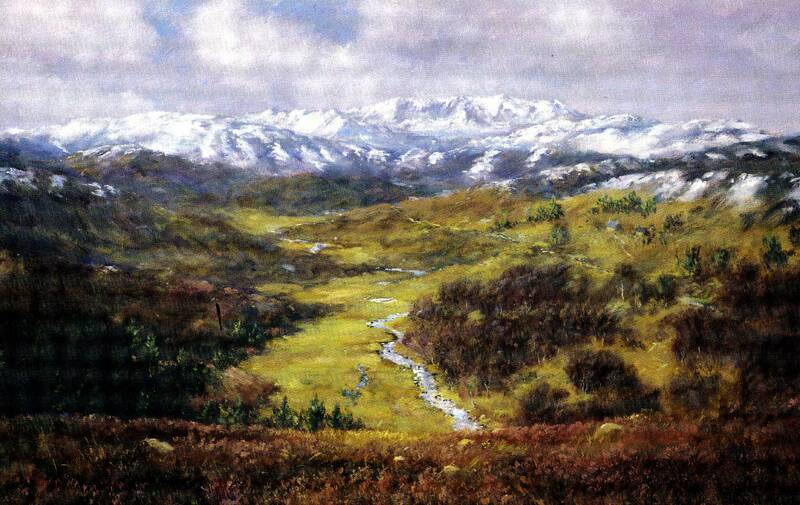 As stated in the ‘Introduction’ the Girnoc glen is neighbour, and runs parallel to, the larger Glen Muick, separated by the mighty range of the Coyle mountains. 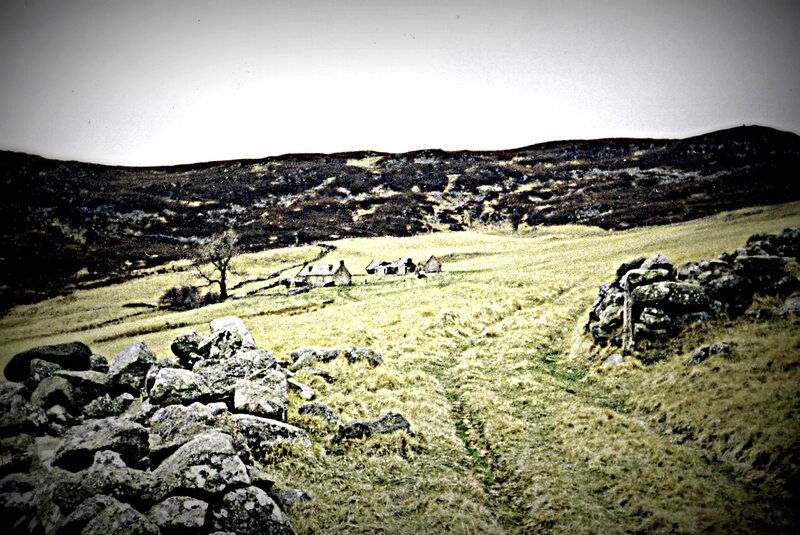 The Girnoc can be approached from three directions; two by road, and one by mountain track. The true approach is from Woodend, a woodland copse at the foot of the Girnoc huddled around the bridge and Littlemill. It is here that one finds the salmon trap, and the soon to be erected eel-trap. Woodend of Girnoc is approached from theSouth Deeside Road, crossing theDee at Ballater. The other approach is from behind Bovagli – to do so you must cross theDee at Balmoral and follow the signs for Lochnagar Distillery. Rising high behind the distillery is a private road to Buailteach, at the end of which is the Deer gate to Bovagli, passing en route Tilfogar, and the Genechal. Bovagli and Camlet were once truly hand-fast, and as such were more than just neighbours, but compatriots of the Girnoc; tounships, communities, and the life-blood of a small-glen. Their days are now forever past. But in their history there is much to tell: of Bovagli there is its link to HallheadCastle and its most principled farmer, Donald or ‘Auld Prodeegous;’ then there is the lost Manuscript and the poems of ‘Crovie John.’ In The Camlet we have of course Abergeldy, but not just! Cortachy and Airly Castle have a place, as does a distant Priory in Fife. Then there is the auld ‘Minister of The Camlet’ and his zealous and sanctified ways. 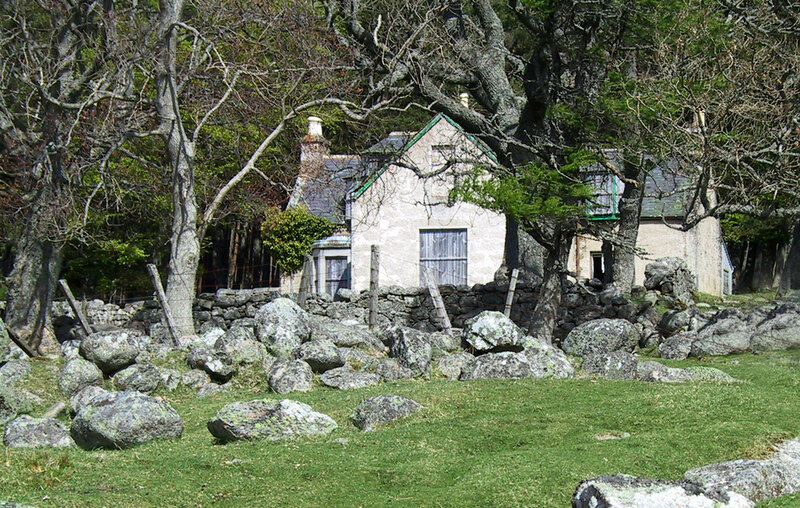 John Brown, Queen Victoria’s Highland Servant has a maternal place in the history of The Camlet, and the Leys family in particular take the Girnoc back to Glen Gairn. Yes, as you can see, there is much to tell. The great Strathspey musician, J. Scott Skinner, wrote a tune called Bovaglie’s Plaid, inspired by a local saying that the wood ‘haps, shelters, Bovaglie ferm like a plaid.’ Today the wood is a shadow of its former glory with evergreen aforestation replacing the mixed hardwoods of ancient copses. Leaving Bovagli, past the Dew pond and through the leaning Scots Pines, one takes the main track towards Balmoral. Auld Prodeegous knew this traverse well – his cart passed it daily, whether it was mutton for theQueens larder, or a less than covert trip, to the Inver Inn, for his favourite stoorum! Tilfogar, like Linquoch, has become forgotten history. In this book I hope to rectify that, for Tilfogar was central to the smuggling system of the late eighteenth and early nineteenth century. That story will be rehearsed in the last chapter of this book, and whilst it is true that Tilfogar is not strictly Girnoc, it had a key crossover with the small glen that could only leave its omission glaring. Mention has been made of the gloriously bearded Adam Watson, and he surely represents the grandfather of the ‘Deeside Detectives’ a colloquialism that I have coined for a whole array of researchers in love with Upper Deeside, all of whom have made it their lifetime gift to pull old Deeside together in an historical amagam of prose and print. The appendix will contain a dedication to these detectives, without whom many of the stories in this book would have been lost for all time. I may never have heard of Glen Girnock, but I have certainly heard of Glen Muich, for I am researching my father-in-law’s family history from the other side of the world, and may of his ancestors name Glenmuich as their home (e.g. View Mount in Glenmuich), though whether that is the location Glenmuich or the Parish I cannot yet say. Glenmuick is neighbouring glen to the Girnoc and is beautiful. Thanks for getting in touch. I was born in Girnoc close to 80 years ago when it was a bustling farming aria. I was 1 of 15 pupils in the Girnoc School, I have to report to you many of your statements are un true, you need to put more research before attempting to write a book about Glen Girnoc and Glen Muick. I am so sorry if I have got so much wrong. I did try my best but fully accept what you say. Would you be able to correct all that I have got wrong. I would like that. My sincere apologies. I hate to think I have got the Girnock so wrong. I did this out of love and for no other reason. I am quite upset at your comments. I am just a visitor to this site, but I too would love to hear some of your memories and knowledge of this area. We visited Camlet today and loved it though bleak on a cold day. The daffodils were out and the gas cooker was still obvious in what was once the kitchen. It is lovely to read about the Glen , a magic place but no eagles today though we saw a crossbill. That is lovely to hear Jo. Thank you for sharing.